Skold, formerly of Freeport, was a teacher who left his job to pursue his passions of poetry and photography. ELKINS PARK, Pa. – The founder of the Dead Poets Society of America suffered a fatal heart attack a little more than a month after commissioning his own tombstone. 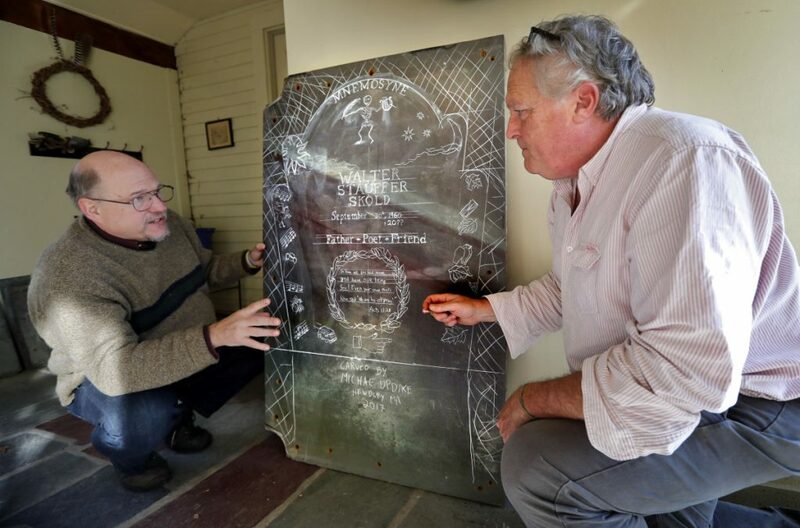 Walter Skold enlisted the son of novelist John Updike to carve a unique tombstone that will be topped with a dancing skeleton and a quill. Michael Updike, who received the poet’s deposit last month, said he never expected to be carving the monument so soon. There was no indication of any premonition of an untimely death before Skold’s passing at age 57 on Jan. 20, in Elkins Park, Pennsylvania, Updike said Friday. Known as the “Dead Poets Guy,” Skold visited the final resting places of more than 600 poets after launching the Dead Poets Society in 2008 in Maine, drawing inspiration for the name from the 1989 Robin Williams movie. 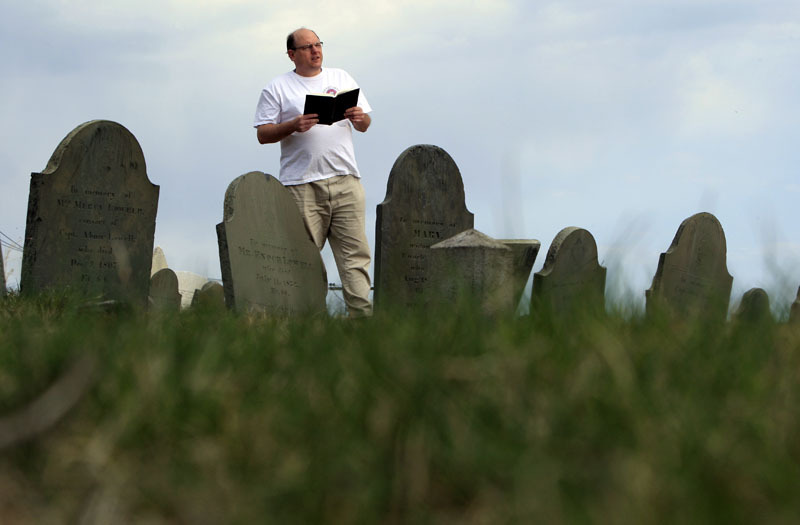 Walter Skold reads a Henry Wadsworth Longfellow poem in Portland’s Eastern Cemetery in this April 20, 2010, photo. Along the way, Skold drew attention to bards and poetry while producing a massive repository of information on poets’ final resting places. He traveled in a cargo van he dubbed “Dedgar the Poemobile,” sometimes embellishing the dashboard with an Edgar Allan Poe bobblehead. Skold was living in Freeport, Maine, when left his job as a public school technology teacher to pursue his passions of poetry and photography and to launch the society. A celebration of Skold’s life is being held Saturday in York, Pennsylvania, where his family burial plot is located. There also will be a remembrance in Maine.